retail scale, verifiable, indication of price and receipt printer, two weight ranges: up to 6 and 15 kg, resolution of 2 and 5 g, memory for the base price of 99 items, memory for direct price of 28 articles, calculation of the change, internal printer, both sides display, powered by an accumulator. The retail scale is a verifiable dual scale. 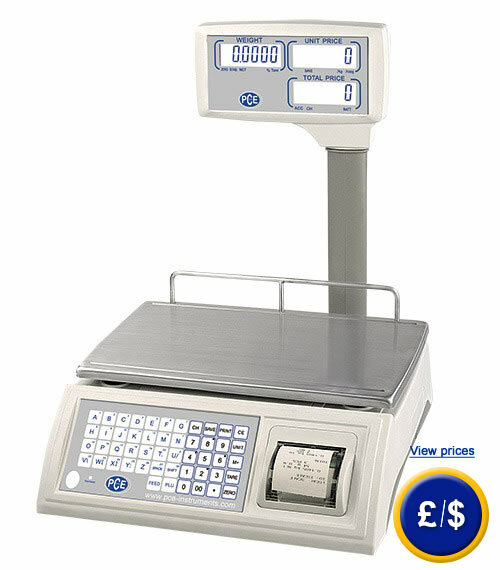 The retail scale with price indication and a weight range up to 6 kg has a resolution of 2 g to 15 kg, and the one with a weight range up to 15 kg has a resolution of 5 g. The retail scale has a memory for indirect base price for 99 items and 28 keys for direct prices. The retail scale with price indication is mainly used where it is necessary to deal with many product prices. It has a high display from both sides. This display of the retail scale informs both the operator and the customer about the base price, weight, and the amount to be paid. The retail scale adds up the price of several items and after entering the amount to be paid can calculate the change. The retail scale is also equipped with an internal thermal printer. The retail scale is powered by a battery that allows an operating time of approx. 200 hours. The housing of the retail scale is made of shock resistant ABS plastic. The stainless steel weighing pan is easily removable for cleaning and its dimensions are of 370 x 240 mm. Here you will find a retail scale which is less professional, more economic and has a price indication. If you have questions about the retail scale, see the technical data below or contact us: +44 ( 0 ) 2380 98703 0. Our technicians and engineers will be happy to advise you on the retail scales and any product of our regulation and control systems, meters or scales of PCE Instruments SL. For companies that wish to include this retail scale in their set of internal testing tools or for annual recalibrations. The ISO certificate includes a laboratory calibration and a control document with all the measurement values. Customer's name and details are included.